Check out our latest taxi trade promotions, promising you a great deal on your next cab. Our Road Ready Used Car of the Week is this 17 plate Toyota Avensis Tourer Business Edition. Maximise your earning power with this Toyota Avensis Tourer , equipped with a 1.6 D-4D engine. Packed full of features including satellite navigation, cruise control and Bluetooth connectivity, this stylish 5-seat estate is available from only £13,995 OTR!! Click below to find out more on our Used Car of the Week or call the number at the top of the page. Bag yourself the all-new, futuristic Hyundai IONIQ from Cab Direct this April and save an extra £200! The fully equipped SE model could be yours from just £75.95 weekly +VAT, saving you an impressive £2,450 off list price. Don’t forget to place your order before 30th April to qualify for this deal. The long-awaited Toyota Corolla Sports Touring is now available to order! As well as benefiting from huge taxi trade exclusive savings, you’ll also get more miles for your money with Corolla’s 1.8 VVTi hybrid engine. In stock now and from £73.95 weekly+VAT you can own the high-spec, entry-level, Icon model, saving a £6,100 against the MRRP. Don’t forget these offers are exclusive to the taxi trade. Click below to find out more on the Toyota Corolla Hybrid or call the number at the top of the page. For a limited time only we’re offering a minimum trade-in value of £2,000 against new model Ford ProCab™! With a bold new grille, ProCab™ looks smarter than ever. Now with even more features as standard, ProCab™ epitomises everything the taxi of today should be. If you’ve owned your current vehicle for 12 months or more and it holds a valid taxi licence plate, then call us now to claim this offer. Click below to find out more on the Ford ProCab™ or call the number at the top of the page. 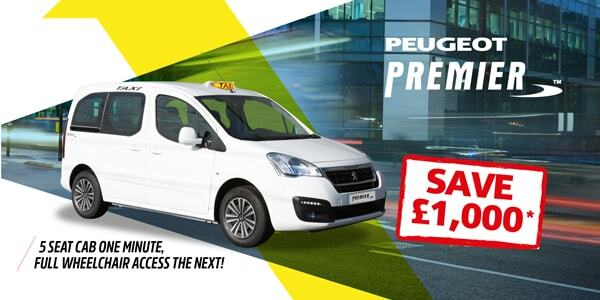 Bag yourself a bargain with our summer special offer on the UK’s best-selling wheelchair accessible cab; the ever-popular Peugeot Premier™. Save a whopping £1,000 on all new Premier™ orders placed before 31st March. Featuring our new generation FlatFold™ ramp, Premier™ offers a five seat car one minute and a fully wheelchair accessible taxi the next – a compact and flexible cab. Click below to find out more on the Premier™ or call the number at the top of the page to place your order now.